The diet of king penguins (Aptenodytes patagonicus) brooding chicks was investigated during February 2001 at the Falkland Islands, where a small but increasing population is located at the limit of the breeding range of this species. Fish was the most important food source by number (98.0%) and reconstituted mass (97.8%), squids accounting for the remainder. Myctophid fishes represented the main part of the diet (97.7% by number and 96.6% by reconstituted mass), Protomyctophum choriodon being by far the main prey item (84.2% and 88.1%, respectively). Four other myctophids and one squid species each contributed to more than 1% of the diet by number: Krefftichthys anderssoni (4.8%), Electrona carlsbergi (4.6%), Gymnoscopelus nicholsi (2.2%) and Protomyctophum tenisoni (1.8%), together with small juveniles of Gonatus antarcticus (1.8%). Twelve squid species were identified from accumulated lower beaks, including the ommastrephid Martialia hyadesi (48.3% by number), the onychoteuthids Moroteuthis ingens (15.6%), Kondakovia longimana (10.5%) and Moroteuthis knipovitchi (7.3%), and Gonatus antarcticus (9.2%). The stable-carbon and stable-nitrogen isotopic composition of chick food and adult blood differed in a way that suggests that, during the same trip, adult birds fed for themselves in distant foraging grounds, and fed for their chicks on their way back to the colony. 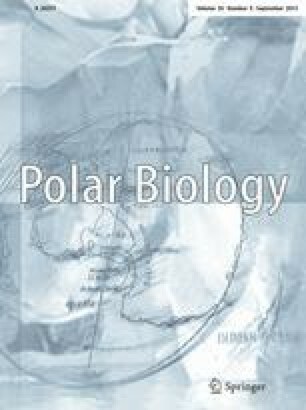 The study emphasizes that king penguins are specialist myctophid eaters throughout their breeding range in summer, and highlights the importance of Protomyctophum choriodon as a link between zooplankton and top predators in the pelagic ecosystem of the southwestern Atlantic Ocean.